Continuity mistake: While Katie Couric is interviewing Sully, the first shot shows her with a portfolio in her hand and she is not wearing a ring on her left hand. The camera goes to Sully, then back to Katie and suddenly there is a ring on her left hand. Factual error: United Airlines aircraft can be seen in the 2010 livery at KLGA in 2009. Also, United Airlines did not have any 737s in 2009. Trivia: During the several scenes where the pilots are communicating with Air Traffic Control, they are always addressed as flight 1549. During the real incident, however, both the pilots and controllers misspoke, labeling the flight number as both 1529 and 1539. This was likely due to the intensely stressful situation. 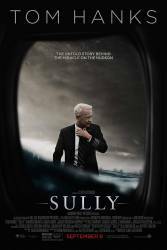 Sully: Everything is unprecedented until it happens for the first time. Charles Porter: Mr. Skiles, is there anything you would have done differently? Jeff Skiles: Yes. I'd do it in July. Sully: It's not a crash, it was a forced water landing. Charles Porter: Simulation showed that you could make it back to the airport. Sully: Impossible. I felt it go.